With rain affecting all games in Division 1 without a single win, so could division 2 hold throughout the rain and prove that wins can come in rainy conditions? His latest oustanding performances earned him a spot in the Lions Squad. At the St. Lawrence Ground, Kent welcomed Yorkshire. When Kent won the toss they decided to put Yorkshire in to bat. It proved to be a great decision as they bowled them out for 247. 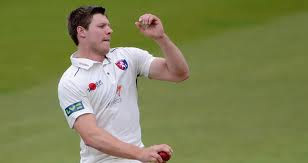 Coles took 4 wickets for Kent but Yorkshire would have been disappointed as alot of batsmen ended up scoring 30's but no one could convert it into a significant knock. Kent replayed making 350-9 of 105.5 over’s with help from Nash who made 132 of 214 balls Not Out, he hit 14 fours in his innings. There was no more playing time in the game left as rain set in so the game ended in a draw. At the Ageas Bowl, it was Hampshire who took control of Leicestershire’s first innings bowling them out for 234. Smith made a strong 68 but it was Dawson’s five wicket haul which tore apart the Foxes batting line up. In reply, Hampshire made 217-4 before the rain set in and haltered Hampshire’s reply, but Carberry on 84 and Ervine 41 both looked good, and the games finished as a draw, Carberry and Ervine finished Not Out. At The Ford County Ground, Northamptonshire won the toss and decided to bowl first. Essex got off to the worst start they could possibly have had on 16-4. It got no better when Bopara was out for 6 leaving Essex on 25-5. They lost just 1 more wicket on 40 before the game was called off due to rain with Essex 54-6. When the game was on it was Brooks who tore apart Essex taking 4 wickets. A 7th draw in the Lv=CC Division 1 & Division 2. So, could Gloucestershire beat Glamorgan to win the first of the 4 days. However, this would involve actually playing which was not possible as the whole 4 days were washed out. 8 games in the county championships but 8 draws. The weather haltering all games. Kent hit top with 49 points but close chasing Derbyshire are only 4 points behind with a game in hand. At the bottom Glamorgan only have 11 points.